Twenty three artists from the State Dance Ensemble of Belarus will perform in Hanoi and Lao Cai Province on May 25 & 27. The State Dance Ensemble of Belarus is a leading choreographic collective from the eastern European country. Founded 55 years ago, the ensemble quickly garnered attention, performing at the Olympia Concert Hall in Paris and in 2008 taking part in the opening ceremony for the Formula One race season in Monte Carlo. The program in Hanoi and Lao Cai will comprise solely Belarusian dances of various genres, including new shows staged recently, in which Professor Valentine Dudkevich combines folk with contemporary rhythms. Professor Dudkevich is a Belarusian People’s Artist and the artistic director of the ensemble. He graduated from the post-graduate course of the Ethnography and Folklore Institute of the Academy of Sciences of Belarus. He holds qualifications in art criticism, ethnography and folklore. He has been the stage director for numerous concerts, including Presidential New Year parties, and was the producer for the opening and closing ceremonies of Belarusian Day at the Slavonic Bazaar in Vitebsk. 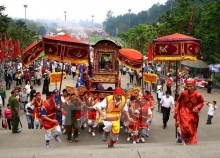 The artists will enchant audiences with dance, music and songs featuring colourful costumes, beautiful melodies, masterly feats and exciting dance performances. 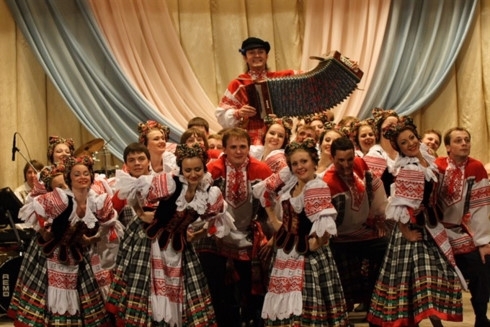 The dances will be traditional Belarusian including the Areli; Lyanok; and Belarus Polka. Highlights of the show will be folk songs Rechanka and Kaval which will be performed by artists Anatoly Taran and Viktoriya Aleshko. Artist Taran won the Grand Prix from the Belarus President’s Special Fund for his support of talented young artists. Soloist Aleshko is a Belarusian Honorable Artist. Over the past 50 years, the ensemble has become a trademark of the country, gaining acclaim in China, the US, Italy, France, Spain and Brazil. The government awarded the ensemble the title of Honoured Collective of the Republic of Belarus in 1999. There are more than 50 actively used concert pieces in the group’s repertoire, which are combined into several big programs. The program Belarusian Casket gathers traditional Belarusian folk dances, the Round Dance of Friends is composed of the world dances, while the program The Song about Bison is dedicated to the most interesting parts of Belarusian history. The concerts will begin at 8pm at Hanoi Opera House, No1 Tràng Tiền Street and the Conference Centre in the northern province of Lào Cai. The concerts are part of cultural activities held for Belarusian Cultural Days in Vietnam to celebrate the 25th anniversary of diplomatic relationship between Viet nam and Belarus.